Welcome to Americas Best Value Inn and Suites Bush Intercontinental Airport West. We are conveniently located off of Texas 8 Beltway Frontage Road/ only 8. 5 miles from George Bush Intercontinental Airport. Our hotel is minutes from the areas most popular attractions including Paramount Park/ Greenspoint Mall/ Great Time Skate/ Richey Road Movie Tavern/ World Houston Golf Course/ Jumpin Jaks/ and Zuma Fun Centers. We are only 15 minutes from downtown Houston. After an exciting day in the Houston area guests can enjoy a great meal at one of our local restaurants such as Green Briar Buffeteria/ Arbys/ or Sergios Mexican Restaurant. Americas Best Value Inn and Suites Bush Intercontinental Airport West offers all of the comforts of home at rates that you can afford. Start your day off right with our free continental breakfast and free fresh 24-hour coffee in our lobby. We also have a guest appreciation welcome reception in our lobby Monday-Friday from 4pm-6pm. Our 7-story pet friendly hotel offers a seasonal pool/meeting facility/ business facility/ exercise facility/ and guest laundry facility. Guests can stay connected with our free high-speed wireless Internet access in all guest rooms and public areas. We provide shuttle service to/from the George Bush Intercontinental Airport and within a two mile radius of our hotel for a charge of 10 USD. Relax in the privacy of your own guest room with amenities including microwave/ mini-fridge/ coffeemaker/ satellite TV with extra channels and in-room movies/video on demand/ hairdryer/ iron with ironing board/ table with chairs/ and free local calls. Our suites also offer a cooktop. At Americas Best Value Inn and Suites Bush Intercontinental Airport West/ Weve Got You Covered from the time you hit the road until your head hits the pillow. 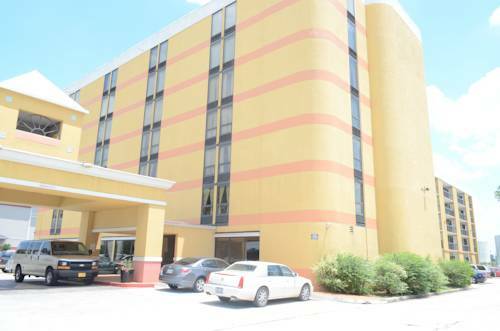 Americas Best Value Inn and Suites Bush Intercontinental Airport West is conveniently located off of Texas 8 Beltway Frontage Road/ only 8.5 miles from George Bush Intercontinental Airport. Our address is 702 North Sam Houston Parkway East/ Houston/ Texas/ 77060.